Hotel located on the secluded beach of Aghia Paraskevi, on the exotic island of Santorini, in Greece. 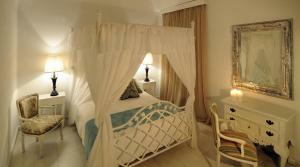 This hotel interprets, in the Aegean style, the traditional architecture of the Cyclades Islands. 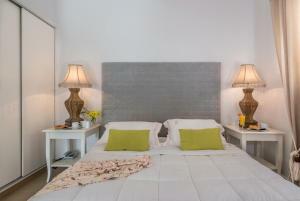 The suite has a bedroom with a private terrace and a separate living room with sea views. Accommodation 2 levels, located in a restored windmill and decorated in a modern style in black and white tones. It also has air conditioning, a flat-screen TV and a seating area. This double room has a balcony, bathrobe and seating area. next articleWhat are the best beaches on the island of Santorini?